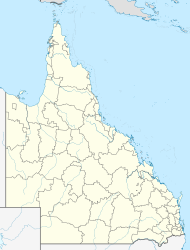 Kobble Creek is a rural locality within the Moreton Bay Region of Queensland, Australia. Kobble Creek is situated along Mount Samson Road to the south of Dayboro, approximately 45 kilometres (28 mi) northwest of the Brisbane central business district. The locality is named after the creek with that forms part of the catchment area of Lake Samsonvale, one of the three main water-suppliers to the metropolitan region. Kobble Creek was, in years gone by, predominantly a dairy farming community with some banana and pineapple farming on surrounding hillsides. As a farming community, Kobble Creek supported a butter factory, primary school, and railway station, the latter two located near the site of the current Samsonvale Rural Fire Brigade. Following the forced resumption of much of the best farming land in the district to build the North Pine Dam and flood Lake Samsonvale, today the district is predominantly a rural-dormitory zone with very limited farming undertaken. Kobble Creek was re-zoned as an administration area in June 2009, but was formerly part of the Samsonvale District. In the 2011 census the population of Kobble Creek was 499, 48.7% female and 51.3% male. The median age of the Kobble Creek population was 39 years of age, two years above the Australian average. 77.8% of people living in Kobble Creek were born in Australia. The other top responses for country of birth were England 6.8%, New Zealand 3.4%, South Africa 0.8%, Canada 0.6%, Cyprus 0.6%. 92.6% of people spoke only English at home; the next most common languages were 0.6% German, and 0.6% American Languages. ^ a b c Australian Bureau of Statistics (31 October 2012). "Kobble Creek (State Suburb)". 2011 Census QuickStats. Retrieved 26 September 2014. ^ a b "Kobble Creek (entry 45444)". Queensland Place Names. Queensland Government. Retrieved 30 May 2014. This page was last edited on 10 March 2018, at 23:50 (UTC).